Manila, Philippines - Juan Karlos Labajo performed Adam Sandler's song "Grow Old With You" during the blind auditions of ABS-CBN's hit singing reality show aired on Saturday, June 7, 2014. 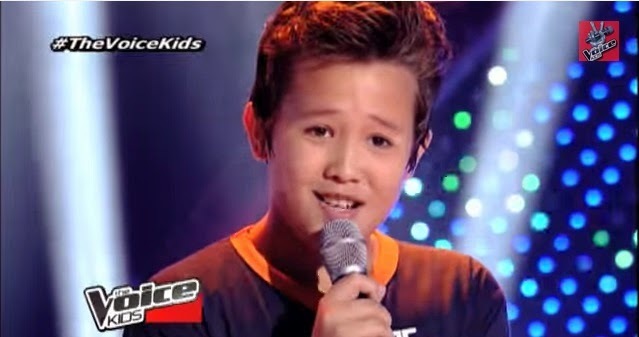 The 13-year-old Juan Karlos wowed the judges Sarah Geronimo and Bamboo Manalac. Juan Karlos chose Bamboo as his coach. Juan Karlos from Cebu City dedicated his song to his mother who passed away in November last year. Juan Karlos performance of “Grow Old With You” already garnered 1.8 million views on YouTube. The Saturday's episode of 'The Voice Kids' dominates online conversations with '#TheVoiceKidsPH', 'To Love You More', 'Isaac', 'Grow Old With You' and Juan Karlos' among the trending topics.